Programr, an online lab for learning to code – yep, sort of like Codecademy, but for higher-level languages, has just introduced Android coding support. 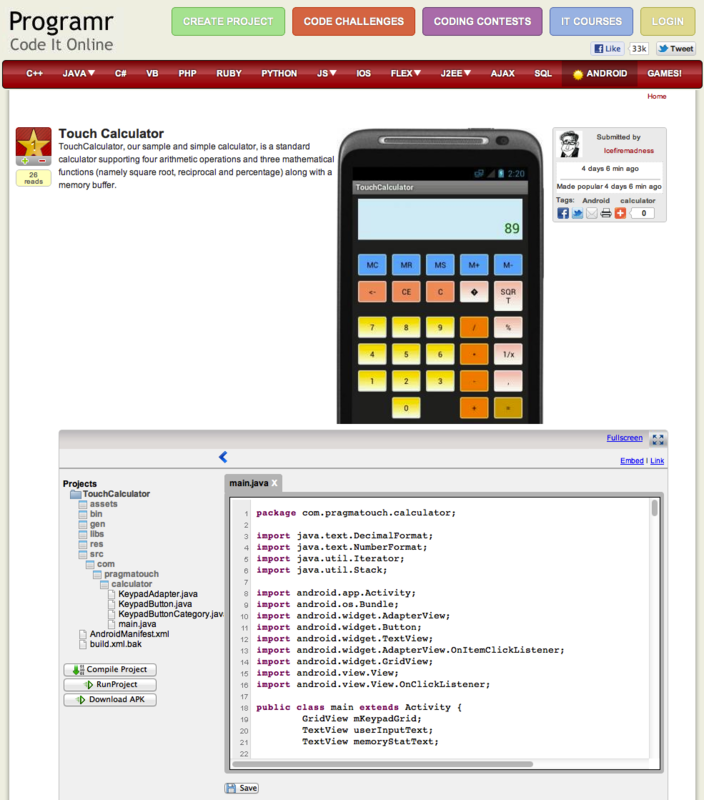 With the added option, aspiring student developers can create Android apps right in the browser. When the project is complete the apps can be downloaded into APK format, then loaded up on your Android devices, shared with friends or sent off to the Android Market…Google Play store. And, says company co-founder Rajesh Moorjani, the startup is working on doing the same for iOS apps next. For a little background, Programr is a new entry in the “learn to code online” space, which has seen growing interest over the past several months, thanks in part, to Codecademy’s “Code Year” initiative which saw some 100,000 users sign up in just 48 hours of going live. This year, everyone wants to learn to code, it seems. Programr isn’t as n00b-friendly as Codecademy, however – it’s more of a complement to that service. Where the latter is really about teaching you to code, Programr is like an online practice ground for creating projects, sharing them with friends, participating in contests, and taking online IT classes. Programmers can even earn points in the contests that allow them to gain free entry to the online classes (normally $30). The startup is also working with regional coding clubs to provide access to its online labs. For example, it recently teamed up with CoderDojo, a club created by Xing co-founder Bill Liao and James Whelton to offer them a co-branded online lab. And Programr is making code widgets available to book publishers in order to make their code listings in their digital books interactive – these “live code listings” can then be run within the book with just a click. With the newly launched Android support, developers can create their mobile apps online and view in them in a web-based emulator. Besides games with a fast refresh rate, says Moorjani, there’s not a limit to the types of Android apps that run on the service. To create an APK file, the code is compiled online and then a student clicks the “Download APK” button. You can see an example of the Android APK option here. Now the folks over at Programr are working on bringing iOS coding to the browser and adding sophisticated granular debugging support for all apps on its supported platforms. They’re also working on a Facebook app that would allow the site’s daily coding challenges to run right within Facebook itself, where the startup has some 33,000 fans (more than double Codecademy’s at last count, incidentally). Interested student programmers can sign up for Programr here. UPDATE: Looks like we accidentally crashed Programr. Stay tuned. UPDATE 2: Site came back up. But you probably figured that out for yourself.